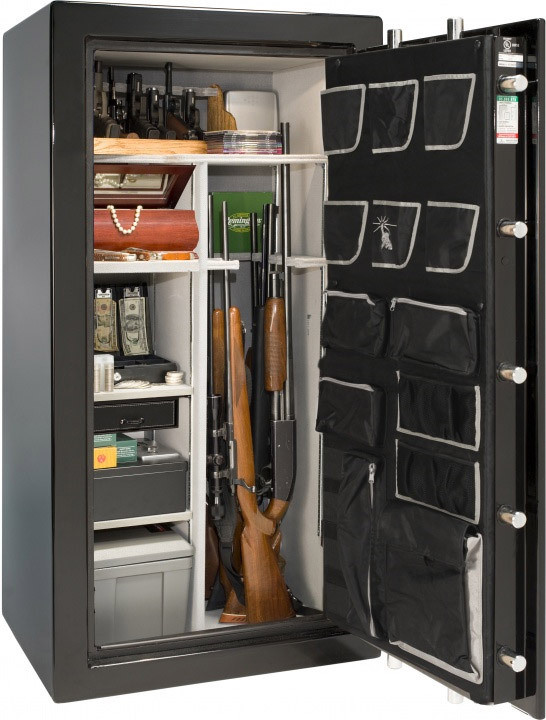 Capacity: 34 guns, 34.7 cubic ft. 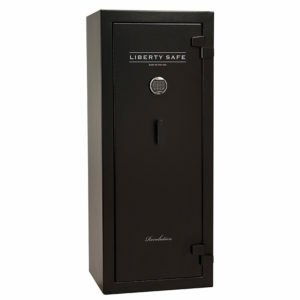 Choose your safe and trim colors below to add your Liberty Lincoln 35 to your shopping cart. Liberty’s Lincoln Series is BIGGER, STRONGER AND TOUGHER than ever before. Plus, Liberty is adding 24/7 SAFELERT monitoring FOR FREE on all Lincolns during our promotional period in 2014. Add that to the DX-90 MONSTER MECH, triple hardplates and durbable SURETIGHT HANDLE and helps resist prying, punching, drilling and torqueing and the Lincoln will be a thief’s worst nightmare. When it comes to class, the Lincoln’s got it, including two prestigous awards from (North American Hunters and Preditor Extreme Gold Awards), ranking Lincoln the #1 series in America. The upgraded ball-bearing hardplate snaps drill bits. Auto on/off Interior lighting is added to all models for convenience in viewing valuables. 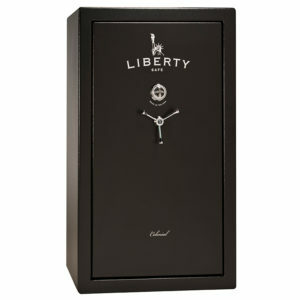 Organize valuables with Liberty’s Premium Door Panel, plus new Jewelry Drawer included FREE. The Lincoln protects valuables from fire damage with four over three layers of fireboard for a industry leading 90 MINUTE FIRE rating. It’s no wonder the Lincoln survived the 2000 degree fires in San Diego. 95,000 BTUs (9,000 more than the Franklin Series) and more fireboard than any of the competitors with similar ratings. Liberty PREMIUM DOOR PANEL is upgraded with dual cool pockets (40 & 50 size models only) and new accent trim. 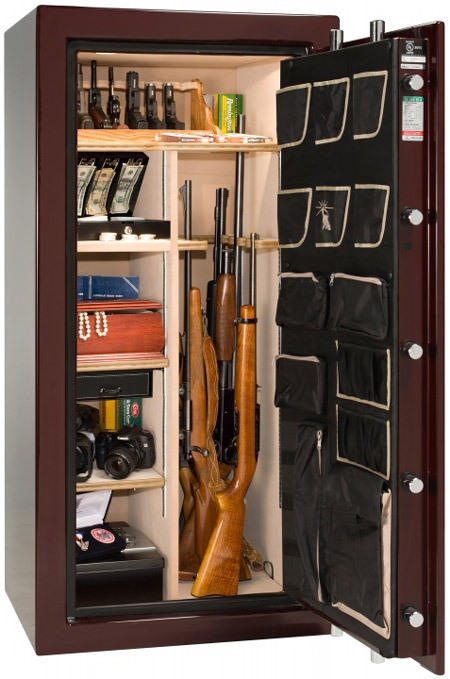 Organize your valuables on the door and free up shelf space. 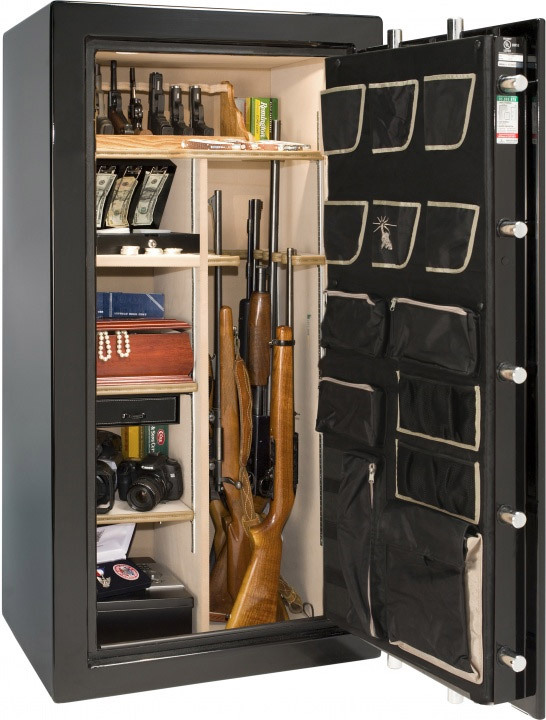 Quick-draw holsters, zip pockets and Liberty’s exclusive Cool Pocket pouches keep papers and documents 50 degrees cooler than the rest of the safe during a fire. This addition makes the #1 selling safe that much better for fire protection.